CA Foundation as the name suggests is laying down basic inquisitive in someone knowledge. The CA Foundation course is to understand accounting principles and implication of study on various kind of accounts. With the change in foreign policy and disinvestment plans, the accountant is adhered to study on the standard of international levels. ICAI has been progressive in understanding the demand of the situation and revising the old course to an updated one. CA Foundation course was earlier CPT course which is now CA foundation course with few changes, with effect from September 2017. The new syllabus is considered to be more competitive and hard as compared to old syllabus . The same tone is been set for all the exams of CA course. This article you will get details about CA Final Course Registration, process, Fees, and Eligibility. The first level on being a CA is CA Foundation. CA Foundation Subjects Principle and basics of accounting. Principle and basics of accounting. All the students who have appeared for 12th examination are eligible for CA foundation Course. Although commerce stream students have the advantage in knowing the subject, students of science and arts stream are also eligible for CA foundation and can apply with the same enthusiasm as they have the edge over commerce students because of their analytical approach. The commerce student should have cleared their 12th examination with 55% and students of science and arts should have cleared with 60% marks. The student who already have registered themselves in old CPT course, but unfortunately couldn’t clear the level, can also apply for CA foundation course. If you are graduate or postgraduate and are inclined to join this profession you are exempted from this level and can directly register at intermediate level via ICAI CA Direct Entry Scheme. If you are eligible for CA foundation registration 2019 you need to look for the dates to register for the course. The last date to register for foundation course May 2019 was 31st December 2018 to appear for May 2019 exams. If you missed the date you can apply for November exams in the month of June. ICAI opens the CA Foundation registration twice a year and the exams are also held twice in a year in the month of May and November. In 2019 foundation exams are being held on 10th,12th,14th,&16th of May. Dates for November will be updated later. CA Foundation 2019 aspiring candidate need to register themselves in June 2019 to appear for exams in the month of November 2019 and register in the month of December 2018 to appear for exams in the month of May 2019. You can only register yourself online through ICAI official website for the CA foundation course. There is no offline registration procedure. You need to be careful while filing your basic details because of any correction after updating levies cost. You need a passport size photograph. Your 12th and 10th std mark sheet. 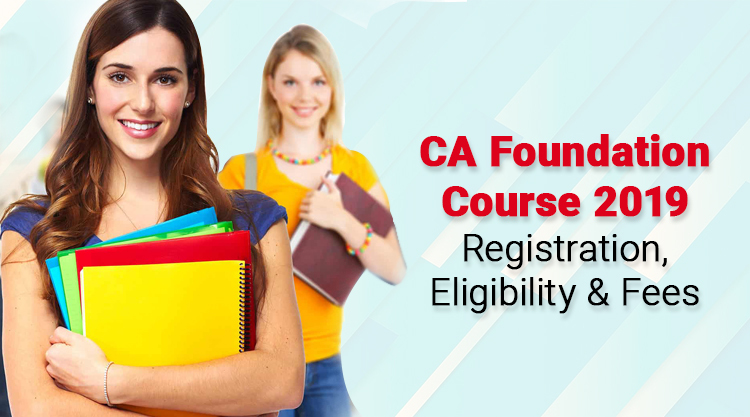 Click on CA foundation course registration form. After filing details you are asked to make payment, which is registration fees and online foundation brochures fees. You should also avail the optional facility of the journal for a student for having updated news related to the course and syllabus. The total amount is of around 9800 which doesn’t include examination fees. You get a registration certificate within a month after the procedure. The total CA Foundation Course Fees is about ₹11300, where you need to pay ₹9800 at the time of course registration and ₹1500 at the time of registering for the examination. The subscription charges for journals are optional but we suggest you register for those journals as it will keep you updated with CA Foundation course and other study materials. The student also enrolls for CA Foundation coaching for preparing themselves for exams. The CA foundation course fees to such coaching institute are around ₹60000 for a year and vary from institute to institute. Once you have registered to this course your validity remains for 3 years. This means if you, unfortunately, fail to clear your CA foundation exam on the first attempt you can have 5 more attempts to clear exams without paying CA registration fees again. Q1 Can I apply for CA foundation course after doing MBA,? Ans: You are exempted from CA foundation course. you can directly apply for CA Intermediate Course. Q2 I am in 12th std and have my exams on March 2019, when can I register for CA foundation course? Q3 Is it necessary to buy journals? Ans No, it’s not. That’s the optional facility. Q4 I am from Canada, can I too apply for the course? Ans: Yes, you can. you need to submit nationality proof at the time of registration. Q5 How much do I need to wait for my CA Foundation admit card? Ans: Your admit card is issued within 15 days of registration. If it takes more than 20 days to communicate at the register office. Q6 I have filled wrong details .what should I do? Ans. ICAI has provided you, recheck window to change your details. It’s free for the first time.You can’t change your name, date of birth. Q7 What is study time? Ans: ICAI provides you mandatory preparation time between your registration and examination date. That preparation time is study time. Hope this article is articulated well enough to have a brief understanding of CA Foundation course. Wish you best of luck for your future. Please be healthy and persistent.